What is better than one Hyatt Promotion -yep, another Hyatt Promotion. This time it is the Hyatt Place Hotels brand of the Hyatt family which is celebrating their milestone of 200 Hyatt Place hotels in nine countries! From August 18th – August 26th if you share a photo which represents the ‘soul’ of Hyatt Place via Twitter, Instagram, or Foursquare/Swarm then you can win a free Hyatt Place night if you are one of the selected daily or grand prize winners. Twenty-four winners are selected each day for eight days and there will also be eight grand prize winners, all of whom receive a free Hyatt Place night. Pictures for the contest can be seen at http://shareit.hyatt.com. 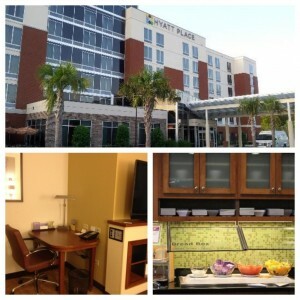 Hyatt Place hotels are really an outstanding value and offer so much to their guests. A real ‘suite’ experience without having to apply a suite upgrade is always a plus! Comfortable beds, breakfast, FREE wi-fi, and great locations – what more do you need? My entry photo was from the Hyatt Place in Charleston, SC. (1) Take a Photograph. First, take a Photograph. Any Photograph you submit in this Promotion must be taken by you. Your Photograph should emphasize the Hyatt Place brand. This could be accomplished by including images of buildings or articles bearing the HYATT PLACE trademark, images capturing distinctive Hyatt Place trade dress, or images taken in an identifiable location within a Hyatt Place hotel. How you elect to capture the Hyatt Place brand is up to you. However, if you enter your Photograph into a Contest, your Photograph will be judged, in part, by the extent to which you capture the Hyatt Place brand, as detailed below in the “Winner Selection” section. (2) Post your Photograph as part of an Entry Post on Twitter or Instagram or as part of an Entry Check-In on Foursquare. You may enter each Contest in any or all of three ways: through Twitter, through Instagram, or through Foursquare. (a) Twitter & Instagram. To enter any Contest using Instagram or Twitter, during the applicable Contest Period, post a tweet from your Twitter account or a post from your Instagram account that includes (i) your Photograph and (ii) the Required Hashtags “#HyattPlace” and “#HPEntry” (in either case, an “Entry Post”). Your Entry Post will appear on your Twitter or Instagram feed, as applicable. (b) Foursquare. To enter any Contest using Foursquare, during the applicable Contest Period, sign into your account via the Foursquare and/or Swarm mobile application. Then, check into any Hyatt Place hotel in the Territory and (i) include in your check-in (A) your Photograph and (B) the Required Hashtags “#HyattPlace” and “#HPEntry” and (ii) click on the Twitter icon or similar button in the Swarm application to post your check-in to Twitter (“Entry Check-In”). When checking in, you may be prompted to sign into your Twitter account if you are not already signed in. To “check in” to a qualifying Hyatt Place hotel, you must be in or immediately adjacent to the hotel property. You must Tweet your Entry Check-In at the time you check in. If you do not post your Entry Check-In to your Twitter account at the time of check in, Sponsor will not be able to communicate with you for purposes of administering this Promotion, which could result in your being disqualified. Your Entry Check-In will appear on your Swarm and Twitter feeds. You must include both Required Hashtags to participate. An Entry Post or Entry Check-In must be received and identifiable by Sponsor during the Contest Period to be eligible. Sponsor, at its sole discretion, may accept or disqualify an Entry Post or Entry Check-In that contains either a technically incorrect Required Hashtag or content that is: (i) superfluous to the required content or (ii) otherwise violates these Official Rules. Entry Posts or Entry Check-Ins that are not both actually visible and timely received by Sponsor will not be entered into a Contest. For purposes of this Promotion, an Entry Post or Entry Check-In is “received” when the applicable Social Media Service records your Entry Post or Entry Check-in and it is visible to Sponsor. Sponsor’s database clock will be the official timekeeper for this sweepstakes. Incorrect and/or incomplete Entry Posts or Entry Check-Ins, posts or check-ins received outside the applicable Contest Period, and/or Entry Posts or Entry Check-Ins that contain obscene, offensive, or any language communicating messages inconsistent with the positive images with which Sponsor wishes to associate itself (all as determined by Sponsor in its sole discretion) will be void. For complete Terms and Conditions, click here. Enjoy these team photos from Hyatt Place Hotels around the world! 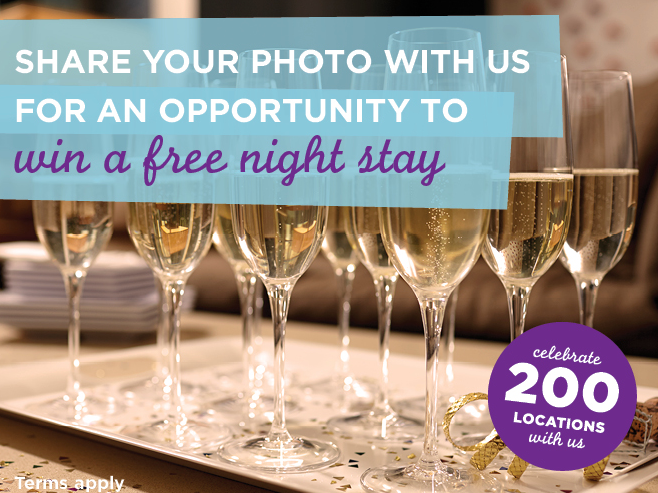 Be the first to comment on "Hyatt Place Hotels Celebrates 200 – Social Media Photo Contest"